Today I want to review a Gregory Backpack, the Z65 Internal Frame. I mentioned in a recent post that I need to get a new backpack for my trip to Mont Blanc in June so the hunt has begun for a suitable pack for the trip. I have already decided that an internal frame as opposed to an external frame pack is the best way to go for this particular trip. 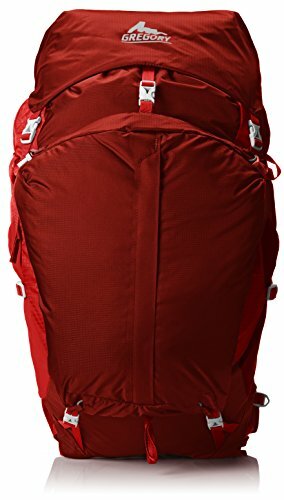 The first thing I want to comment on about this pack, is that it’s ideal for extended multi-day hikes. With a capacity of 65 liters, it is a multi day backpack. Good for a few days wild camping where you need to carry a fair bit of camping kit with you. With that in mind, it is not really suitable as a day pack, just too big in my opinion. This is something to factor in if the majority of your hiking is day hiking. It may not be a great idea to buy a pack that is best suited for extended trips. The next thing to comment on that many folks complimented this pack on, was it’s airflow ability. Internal frames can be known to cause your back to get very sweaty so to read that this one has a good airflow via the JetStream LTS construction, one that works I hasten to add, is really good. The pack also has moisture-wicking mesh and breathable foam throughout. Next, we move on to storage. One of the cons of this pack I feel is that it could have more pockets. However that is really down to personal preference. There is ample space in the main compartment and the pack comes in three sizes, small: 3539 cu.in (58 Liters), Medium: 3906 (64 Liters) cu.in and Large: 4272 cu.in (70 Liters). The main compartment is accessed by an all-access front zip which means its handy to get into the pack. This is very useful to get at stuff further down in your pack after it has been packed up. Otherwise, you need to take stuff out to get at the contents below. The Gregory Z65 backpack also has quick access waist-belt pockets which are good for things you need to keep on hand. To conclude on the storage capabilities, the Z65 also has dual hydration ports and sleeve so you can easily carry a hydration pack. The zippers throughout the pack are welded and water resistant to prevent rain drip through them so your gear stays dry. I highly recommend always putting the contents inside your pack into either bin liners or dry bags, to help keep you kit dry. If you’re hiking in winter type conditions, or climbing a mountain like Mont Blanc, you can take advantage of the ice axe loops on the Gregory Z65. There are additional attachment options available on the pack as well. Moving on, a key function I want in a backpack is good weight distribution so I can carry all my gear on the trail as comfortably as possible. The Gregory Z65 has a lightweight framesheet made with a hollow aluminum stay. This design enables easy support of heavier loads while keeping you as comfortable as possible as you move. The weight is further catered for by the exterior compression straps that ease the weight load on your back. The dual-density lumbar foam pad transfers weight from your back to your hips, and the adjustable waist belt has a plastic HDPE stiffener for a better carry. The pack has an auto-fit harness system which can be adjusted to fit comfortably. These generally speaking work quite well in my experience. The harness is also specially designed to eliminate hot spots which can develop in many packs. Finally, It’s worth mentioning here that this pack is designed to be used by both men and women. Weight: 3 lb. 15 oz. Weight: 4 lb. 7 oz. The Gregory z65 Backpack is a popular pack and ticks many of the boxes I need for my trip to Mont Blanc. The key attractions for me for this are good air ventilation to the back when carrying, as well as good suspension and weight distribution allowing easier weight carry. The easy access zipper into the rucksack from the front is also a nice feature (Getting into your gear can be a real pain in some backpacks if it’s packed at the bottom!). Overall, this pack looks and acts the part and has a a lot of positive customer feedback to support it! Have you used Gregory backpacks before? How did you find them? I’d love to hear about your experience in the comments below.